Nwoya district has registered over 60 cases of suicide in the last three year alone, according to local authorities. The latest victim was Irish Kitara Otto, the former Local Council 3 Vice Chairperson of Purongo Sub County in Nwoya district. Otto’s body was found mid last month hanging on a pole, with a rope around his neck, inside his grass thatched hut. According to the deceased’s wife Akera, her late husband had on several occasions accused her of practicing witchcraft. Some of the suicide victims are as young as 13, majority them are young boys who either ingest agro-chemicals or use ropes to end their lives. The most affected sub Counties in Nwoya are Koch Goma and Alero were at least 14 people have committed suicide including a 17-year-old girl who killed herself over love affair gone bad on the eve of Christmas late last year. Fredrick Okecha, the Nwoya District Secretary for Community Development told Acholi Times that in the last one month alone, at least three cases of suicide were reported—two in Purongo and one in Anaka sub county. According to Okecha, the two deaths brought to 62 the number of suicides in Nwoya since 2014. Okecha attributes the rising cases of suicide in the district to domestic violence and traumatic experience suffered because of two decades of war in northern Uganda which ended in 2006. 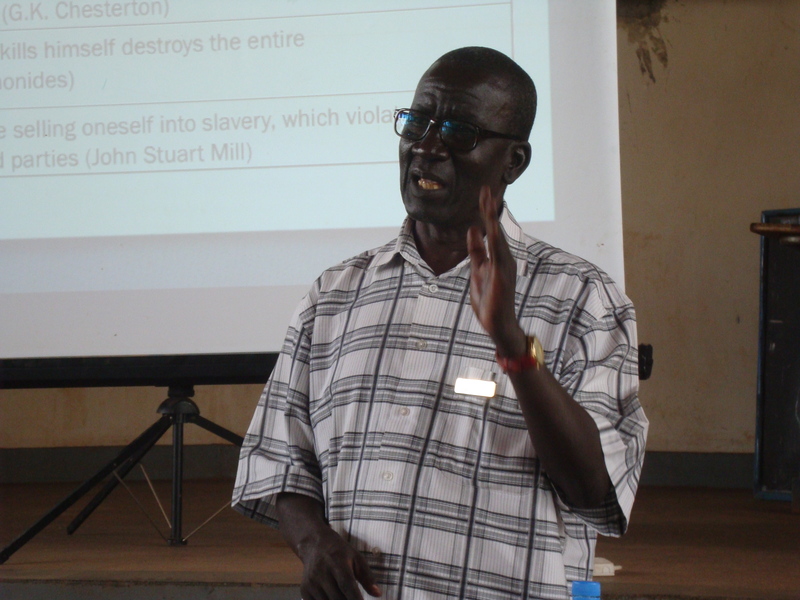 Elders in Acholi attribute the high cases of suicide to lack of proper burial accorded to those killed during the war by either the government or rebel forces. Elders have performed series of cleansing ceremonies with intention to exorcize the spirits of those who were not properly buried. But the suicides continue. Prof Emilio Ovuga, a senior psychiatrist who has carried out dozens of studies on the link between mental illness and post-traumatic stress disorder (PTSD) attributes the suicide cases to post traumatic stress. Recently, Prof Ovuga also called on the government to decriminalize suicide emphasizing that people who attempt to commit suicide must be assessed to ascertain the nature of their psychiatric problem. While presenting a paper on suicide Prof. Ovuga argued that instead of charging a person who has attempted suicide, it is better to allow the family of such individual to take them to hospital to receive treatment for their mental condition. We are so deceived by so White Western and Arab religion to the extent that we the African walk like ZOMBIES completely ignorant of our true cultures. Look at the SCANDALS dogging the Catholic Church worldwide – paedophiles etc yet we allow them to baptize, marry and burry you?!! Okecha is right. All these completed or attempted suicides are results of PTSD. Lets deal with reality and not superstition.How can lack of proper burial cause suicide? Culture can sometime mislead because it is not based of scientific facts, but only believes. If you follow each of the suicide case, something trigger him or her to the act.That clearly mean the individual was already dealing with anxiety and depression. Most of the victims are in their youthful age, and might have been having difficulty in adjustment, or have family problems. All these are pointing to early traumatic experience[s]. For one to commit suicide, one must have pre- planned. Suicidal thoughts and ideas begin early before the action, even when the victim is already depressed. Some might have been an attempt to seek for attention but if ignored can result to death. More need to be studied about the behaviors and family background of these victims prior to the suicide.